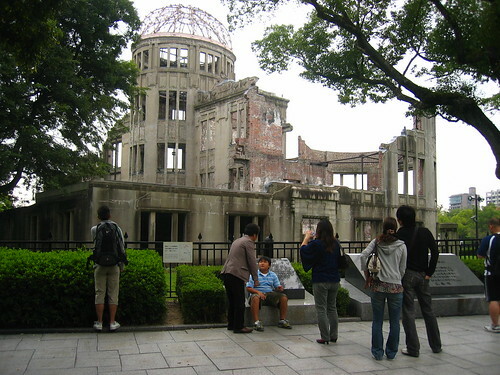 A peculiar feeling emanates from the subsisting A-bomb dome in Hiroshima (or genbaku dome), for it is both a touristic attraction and the historical remains of the most powerful weapon used in a war. All around, the city feels like happy place, neither too huge, nor too urban, mostly thanks to the tramways that give it a friendlier, warmer touch than a more industrial subway, almost rural, in spite of its 1.1 million inhabitants. The Peace Memorial Park is an island of calm and, thanks to the dozens of children running around with their color-coded caps, it breathes life. In fact, it is one of the rare modern city parks I have encountered in Japan. The Peace Memorial Hall and Museum offer a strong and important testimony about the events, without unnecessary nationalism, nor without minimizing Japan’s responsibility in the war. Before anything else, it’s a plea for peace and a call to all countries still relying on nuclear weapons. 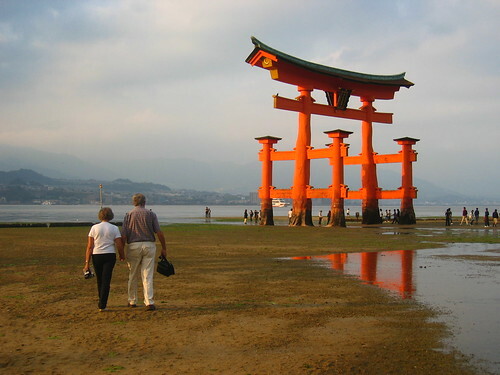 Which leads back to the particularity of the Dome: unlike the beautiful Buddhist temples and shinto shrines, including the impressive torii in the water on the nearby island of Miyajima, unlike the stoic castles of local medieval lords, unlike even most of the contemporary architectural masterpieces, the Dome is the flagrant icon of events which opposed Japan to the outside world. It might be entirely coincidental, but it appears to me that the prime touristic attraction explicitly referencing the foreign world is the memory of the tragedy which ended the last massively armed interaction between Japan and external countries.